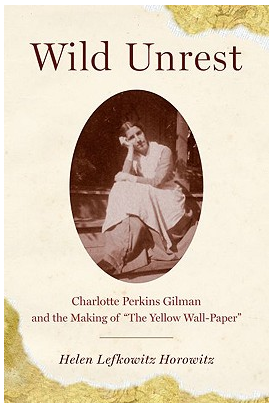 In Wild Unrest: Charlotte Perkins Gilman and the Making of “The Yellow Wall-Paper,” Helen Lefkowitz Horowitz presents a detailed reading of the bountiful diaries, journals, and correspondence of Gilman and those close to her leading up to the publication of her famous short story. Her papers reveal that during her courtship and marriage to her first husband, Charles Walter Stetson, she sought to reconcile both her conflicting desires to be in a relationship and to remain independent with Stetson’s more traditional views regarding women in marriage. By also analyzing Gilman’s reading habits to show how they shaped her social and political views, Horowitz demonstrates that they informed this internal struggle. A reader of Popular Science Monthly, Gilman picked up the deterministic philosophy of Herbert Spencer but also William B. Carpenter’s ideas on the importance of the will. Surprisingly, Horowitz also reveals that in her early twenties, Charlotte was uninformed about the women’s rights movement and lacked personal knowledge of role models for being an independent married woman. It wasn’t until 1886-1887 that she became immersed in the feminist Woman’s Journal. Horowitz’s main argument is that despite her claim, Gilman did not write the “The Yellow Wallpaper” as a critique of the one-month “rest cure” she was prescribed by the famous Dr. Weir Mitchell in 1887. The rest cure consisted of a large amount of bed rest, seclusion, massages, electrotherapy, and a diet of increased fat. In contrast to the active “camp cure” prescribed for men who suffered from neurasthenia, the rest cure was symbolic of the circumscription of women in general. (Interestingly, by the time Gilman was treated, Mitchell had altered his views to allow for more physical activity, which explains his recommendation that she follow through on her interest in working at a gymnasium upon returning home.) Twenty-six years after her stay with Mitchell, in a 1913 article in her periodical Forerunner, Gilman wrote that the “best result” of her short story was its influence on Mitchell, whom she had sent a copy. “Many years later,” she noted, “I was told that the great specialist had admitted to friends of his that he had altered his treatment of neurasthenia since reading ‘The Yellow Wallpaper’.” Horowitz argues that while the rest cure was a significant event in Gilman’s life, the short story told more about Gilman’s feelings toward Stetson and the institution of marriage than how she felt about Mitchell’s treatment. Noting that, “History has portrayed the reasoning Charlotte with the strong will as the true Charlotte,” Horowitz does an admirable job of untangling the accepted truth from the more personal one detailed in years of correspondence and journal and diary entries. My only question surrounds the lack of documentation during a crucial time: Gilman stopped writing in her journal from 1887, the same year when she went to Mitchell and around the same time when she became a more avid reader of Women’s Journal, and 1890, when The Yellow Wallpaper was written. I would have been interested in some speculation about how Gilman’s deeper immersion in the suffragist publication and women’s issues might have begun to inform her writings and how she perceived them. Did it help solidify, in the remove of years, what she saw as the short story’s purpose? As it stands, Horowitz could not do anything about this gap and it does not, in the end, negate her well-researched and compelling argument. Wild Unrest would be a good read for anyone interested in knowing Gilman’s early years and influences. Daisy Dominguez is an assistant professor at the City College of New York, CUNY. Charlotte Perkins Gilman, “Why I Wrote ‘The Yellow Wallpaper’,” in The Captive Imagination: A Casebook on The Yellow Wallpaper, ed. Catherine Golden (New York: The Feminist Press, 1992), 51-53. The mental asylum of San Servolo,Venice (1860–1978): plots, classifications, subjects. Epistemology and history.